Fire Alarms are one of those systems that tend to be forgotten about until crisis strikes. All buildings whether publicly or privately owned have a legal requirement for a minimum level of protection. Prestige Protec Systems can ensure that you have the necessary level of protection to fulfil these requirements, in a cost effective and efficient manner. Type P1: Property protection, automatic detection installed throughout the protected building. Type P2: Property protection, automatic detection in designated areas. Type M: Manual system (breakglass call points). Type L5: Life saftey generally when specific fire engineering solutions or where PI insurance is required. Type L4: Life saftey system, same as manual system plus smoke detection on escape route. Type L3: Life saftey system, same as manual system plus smoke detection on escape route and heat or smoke detection in adjacent rooms. 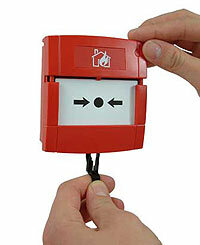 Type L2: Life saftey system, same as L3 but detection in fire hazard/risk of ignition i.e. kitchens, sleeping areas and other specified areas. Type L1: Life saftey system, similar to P1 but the audibility is more critical. Any project starts with a Fire Risk Assessment; this involves a comprehensive assessment of all sites and buildings. Based on the assessment we can then design, install or repair any equipment as necessary to ensure new and existing buildings comply with Fire Regulations and maintain structural fire integrity. We then develop an ongoing maintenance plan to suit the system and the environment to which it is installed. We use industry standard components and open protocol systems which can be worked on by any competent contractor.